The written word has been a crucial part of human civilization for thousands of years. Words, their pronunciations, meaning, and spelling are living creatures that evolve over time. An excellent example of this is the word “the.” I’m sure you’ve seen the Old-English word ‘Ye.” While many think that’s a ‘Y’ it’s called a “thorn” and is pronounced as “T-H” so “Ye” is pronounced “The.” This is a good example of the subtle evolution of language. Today’s social media world has added to this development and vastly accelerated it. So, in the age of the Internet, should your social media be grammatically precise? Are you turning away customers with words and phrases boiled down to a mere handful of letters? The second significant consideration in the linkage between grammar and social media is the platform that you’re writing on. Instagram and Pinterest, for instance, are based almost entirely on visual presentation and typically only hashtags, or a short caption will be posted with the photo. In these cases, grammar is almost irrelevant. 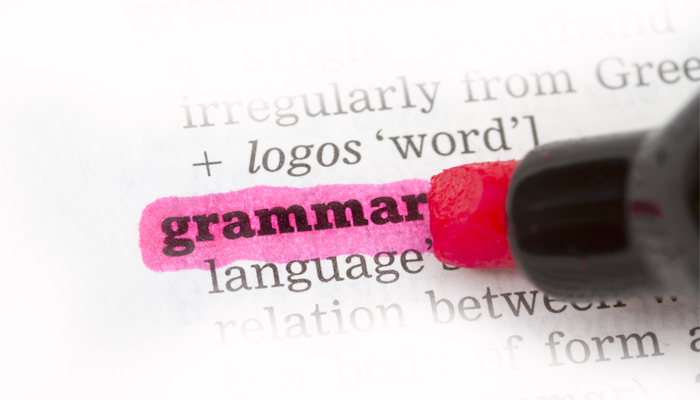 On Twitter, where space is limited, grammar has much more flexible rules. Trying to get a cohesive idea into a space of 140 characters is part of the challenge of Twitter, but it also allows a bit of forgiveness from users both young and old. Everyone understands the limitations on Twitter, so using “UR” instead of “You are” saves five precious characters. Leaving out commas or other “correct” punctuation is typical too on Twitter because, again, it’s all about character space. Moving on to Facebook, Tumblr, and LinkedIn writing more text is allowed and even encouraged. On these sites, particularly on Facebook and Tumblr, generational or personal preference takes hold. However, of the three, LinkedIn is the one social media platform that is particularly demanding when it comes to proper grammar. LinkedIn is, after all, dedicated to connecting Business to Business and employees with employers. Above all else, this is where you will want to showcase command of the written word when trying to get the attention of a future boss. There is another school of thought that some social media experts support: not everyone takes notice. For the most part, the younger millennial is not focusing on the punctuation so much as they are on the content. For the older Gen X’er, punctuation is still necessary but they might consider loosening the standards because of space constraints. Perfectionists will want to put every comma and semicolon in its right place. An approach that may have been helpful in the past but can turn into an actual detriment to success. In the age of the Internet, speed has overtaken accuracy when it comes to web-based content, and grammar has suffered because of this cultural shift. Both the perfectionist and the grammar challenged can agree one key thing, the purpose of social media is to communicate. It is important that the lazy writer understand the importance of punctuation, accuracy, and having a rich vocabulary. By the same token the perfectionist needs to understand the new ways in which language is evolving or they run the risk of being ignored by the masses and failing in their efforts to connect with their target audience. It’s easier to learn the rules and break them, when necessary, than to ignore the rules and later on try to fake them!